The world of Glee has itself begun to confront the built in shelf life of its format by moving several major characters of previous seasons—notably Lea Michele's Rachel—off onto the next phases of their lives, while still attempting to maintain a central focus on Lima, Ohio's rather improbable McKinley High. That means that there's a "new" Rachel (of sorts, anyway, and in fact this season's premiere episode is actually titled "The New Rachel") on hand in featured character Marley (Melissa Benoist), as well as several other recruits to the New Directions glee club. Glee is one of those shows which exploded into pop cultural omnipresence seemingly immediately after its premiere, and then has had something of a hard time maintaining its "relevance" (whatever that might consist of) and momentum over its ensuing years. That tendency continues throughout the fourth season, which sees some interesting developments and has some nice guest star turns, but which also suffers from a seemingly insurmountable fractured ambience stemming from having to deal with too many characters (something the show has always struggled with), now exacerbated by the fact that at least some of them aren't in Lima anymore. Glee has of course recently been reeling from the death of Cory Monteith, something that ironically elevated its public profile once again after a couple of years of diminished interest, though obviously in a less than desirable way. That notoriety was only increased with the remembrance by Jane Lynch afforded to the late actor during the recent Emmy Awards, something that was unwisely hyped by CBS beforehand (in an obvious, unseemly and desperate seeming attempt to lure viewers—which it did), and created a backlash when relatives of and those who worked with arguably much higher profile stars like Jack Klugman were not given similar treatment. Despite this controversy, Glee's fourth season has a certain bittersweet quality now as longtime fans catch their last few glimpses of Monteith as singing quarterback Finn Hudson, which are frankly not that numerous to begin with. Glee, for all its dramatic excesses, is probably more appropriately enjoyed as the modern day successor to what used to be termed variety shows. Baby boomers grew up with a glut of these shows, typically hosted by a singing or comedy star. The fifties and sixties were full of these outings, wonderful weekly outings featuring the likes of Andy Williams, Dean Martin, Danny Kaye, Dinah Shore, and of course Carol Burnett. The format fell out of favor as the seventies and eighties moved along (and production costs skyrocketed), meaning even major talents like Julie Andrews and Dolly Parton couldn't sustain any measurable success. Looking back now on this perhaps underappreciated halcyon age, it seems frankly miraculous that on a weekly basis, huge production numbers could be put together, almost always with special music. Glee has the relative luxury of not being played out in front of a live audience, but it brings much of the same luster to its musical elements, which remain the highlight of this perhaps increasingly lethargic series. Without putting too fine a point on it, especially considering the season long arc of Rachel dealing with a demanding dance instructor played by Kate Hudson, Glee seems to be having a hard time finding its footing. Individual moments work quite well—the subplot involving Marley and her morbidly obese mother being one of them—but more and more, the series seems to be lurching dangerously toward self-parody at times. There's melodrama running rampant here that is decidedly hyperbolic (Rachel maybe has a new New York based boyfriend, and new singer Jake, played by Jacob Artist, is a moody problem child), leading to a comparison with another much less successful show which attempted to blend theater, music and television, NBC's Smash. Countering this is Glee's still occasionally piquant sense of humor, especially when it's emanating from Jane Lynch's cheerfully acerbic Sue Sylvester. And the series continues to offer knockout musical performances week after week, most of them brilliantly staged and at least decently sung (though a lip synching issue is fairly apparent some of the time). Some of these include homages to various stage shows (the kids put on a production of Grease this year) or films, but others, like the opening montage introducing us to Marley and detailing Rachel's singing audition at NYADA, which has the two singing Billy Joel's "New York State of Mind", are state of the art presentations that feature incredible production values and, more importantly, relevant tie ins to the plot at hand. Glee: The Complete Fourth Season is presented on Blu-ray courtesy of 20th Century Fox Home Entertainment with an AVC encoded 1080p transfer in 1.78:1. As with previous seasons, Glee is bucking the trend of digitally shot series television, continuing to film the show in the Super 35 format. This gives a nice texture and added density to scenes, where some of the "stage lighting" for some of dance sequences is especially impressive looking. Glee: The Complete Fourth Season continues the tradition of offering a lossless DTS-HD Master Audio 5.1 mix on Blu- ray. In the musical sequences, the soundtrack is fully engaging and fully engaged—employing the surround channels to often delirious effect. While there's certainly good use of immersion in other non-musical scenes—the crowded halls or lunchroom of McKinley High, or some of the ambient environmental noises employed in the Manhattan locations—dialogue still tends to be fairly centrally anchored. That said, fidelity is excellent throughout this presentation, and dynamic range is extremely wide, given the gamut of musical styles explored. Glee Music Jukebox: offers a tour through the musical sequences of each episode on the disc. Movin' On Up: Glee in NYC: features interviews with various cast members talking about The Big Apple. Jarley: For those as yet uninitiated in the Glee universe, Jarley refers to the couple of Marley and Jake. Get it? Building New York: focuses on the set design for the New York scenes. Glee On Film: is about the episode themed around film music. The Road to 500: The 500 refers to how many musical numbers have been performed on the show. Blaine's Time Capsule: is a faux "video message" Blaine sends to his "future self". It might be tempting to say that Glee has finally jumped the shark. That assessment may be a bit premature, but the death of Monteith is certainly going to be a wake-up call for the series. Just last week the episode "The Quarterback" aired which dealt with the death of Finn. No mention was made of how he died within the world of the show; instead they chose to focus on the characters and actors emotions toward the loss of their friend. I have to say they handled it well, and in typical Glee fashion. Continuing the attrition of their "first class" of stars is going to tell the tale of whether Glee was, to paraphrase one of their previous seasons' themes, a "one hit" (and/or "one season") wonder, or if, as Variety likes to say, the show has "legs". The musical moments continue to be stunning little mini-masterpieces at times, well sung and often imaginatively staged. The other elements of this series, while fitfully engaging (and relying on a bit of stunt casting now and again), seem more and more like they should have closed out of town. Fans will no doubt still want to pick up this package, as it offers generally great video, superb audio and a nice array of supplementary materials. 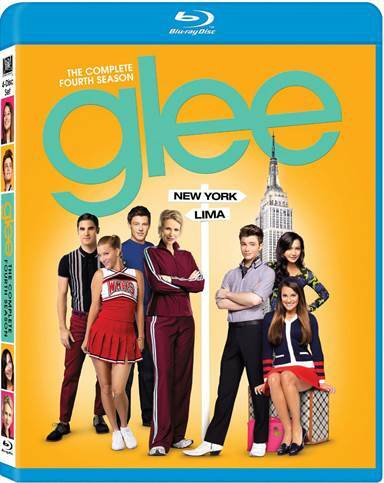 Download Glee: The Complete Fourth Season from the iTunes Store in Digial HD. For more information about Glee visit the FlickDirect Movie Database.